Whether you've got a mountain of Muji (I wish! ), the Ikea Alex units, or a more unique, storage set-up, it needs to be organised. Not only will a well laid out collection help you to see all of the products you have, encouraging you to use them more often, but it will also save you time in the mornings, as you won't have to rummage around for hours to find something, hopefully! Taking the entire contents out of the drawers to sort through, is a great opportunity to make sure all the drawers are clean. I'm sure we've all experienced a product leaking or a pot of glitter exploding, before. Then, you need to think about layout. Personally, I like to cluster my products by type. 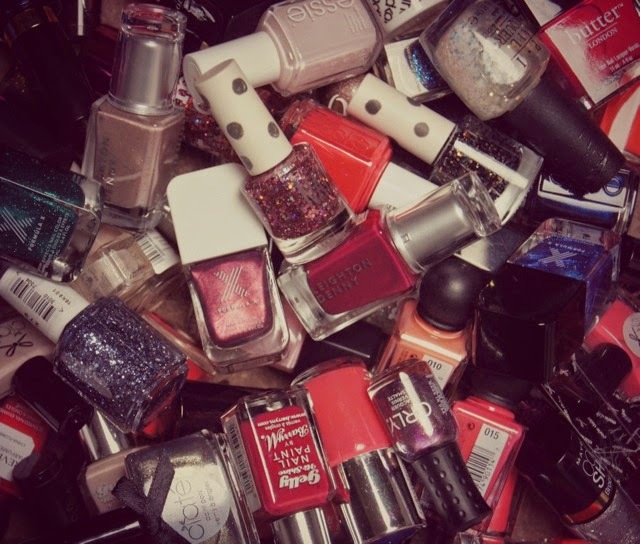 Depending on how large your collection is, you could further section the products into colours, formulas or drugstore/high-end. If you have large drawers, it's best to section them so that every product has its own place, rather than being lost in a mess. You can buy specifically-made, interlocking inserts and dividers, from Ikea, Muji or even stationary shops. For a budget option, you could try saving up your beauty subscription boxes, or cut up old gift boxes, cereal boxes etc to the size you want them. A cheap cutlery drawer could even do the trick, if it's the size you need! I like to keep my daily essentials on top of my drawers, in a glass fruit bowl, so I have them to hand. Every weekend I'll switch up the items that are in there, so that I'm constantly rotating the products I'm using. If it smells, looks or feels funny - throw it out! The first and most important step of sorting through your stash, is getting rid of anything that may have gone off or could cause any bad reactions. On the back of every beauty product, there's a little symbol that tells you how long, after opening, the item should be kept. A beauty use-by date, if you will. Honestly, I don't always stick to these restrictions and use my common sense. Things like how the product is packaged, if you've shared makeup with others and whether you've had any infections makes a difference to how long you should keep a specific item. For example, powder products can last for years, whereas cream or liquid formulas can deteriorate a lot more quickly and harbor harmful bacteria. If a foundation comes in a fully sealed bottle with a pump, then that will be much more hygienic than a pot that you dip your fingers into. But, one thing that you can't take a risk with is mascara; even if it hasn't dried up after being used for three months, then it should still be chucked in the bin, I'm afraid. Eye infections are never a good look! To kill germs and prevent the growth of bacteria, you can spritz your makeup products with a sanitizing spray, such as The Pro Hygiene Collection Anti-Bacterial Makeup Spray, to extend the life of products. They can be used after every application on practically all makeup items, from cream blushes, to loose powders. Unfortunately, they don't work with mascara. This whole idea won't work if you aren't merciless. There's no time to reminisce about purchasing a product if it's unnecessarily taking up precious space in your collection. Although, if it's particularly sentimental, like the first piece of makeup you bought, the lipstick you wore on your wedding day, or a special gift from a family member, then definitely keep hold of that! Otherwise, if you haven't used it for over a year, get rid! Even on that rainy day that you're waiting for, you'll want to reach for your holy-grail must-haves, rather than that palette of neon-brights that you bought in a brave, defiant moment of madness. Parting with unwanted makeup doesn't mean it has to go straight into the bin. If there's a product that I know a family member or friend may want, then I'll make sure it's thoroughly clean and then pass it on to a new, loving home. If In Doubt, Try It Out! Ok, so this is a method that I use when I'm really struggling. If a product that you haven't used was particularly pricey, or everyone else raved about it when you were left disappointed, then it can be difficult to let it go. I put these items aside and give them another chance by using them for a week or so afterwards, to see if my opinion has changed. Or, I'll stash them into a hidden place that I'll forget about and see if I miss them being in my collection over a couple of months. If they haven't made it into my makeup bag by then, it's time to wave goodbye! 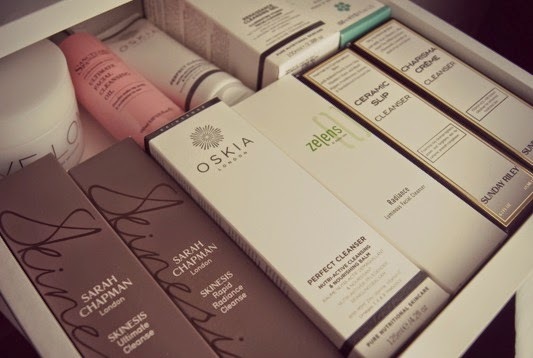 Sorting through your collection is a great way to re-discover products that have been shunned after new releases have come into the limelight, but there may have been a good reason why they ended up at the bottom of your drawer! Ask someone you trust for advice! Chances are, if you haven't used a product much, it's because you didn't like how it worked for you. Maybe that foundation didn't sit well on your skin, or that lipstick that caused major blogging hype just looked wrong with your skin-tone. My tip is to ask your mum, friend, partner or anyone you trust to be honest and say whether they think the product suits you, or looks unflattering. After all, not every tone of red lipstick suits everyone's complexion and different tones of eyeshadow will look better on different eye colours. Would you want to keep wearing a makeup product just because it's popular with everyone else, even if it doesn't flatter your look? 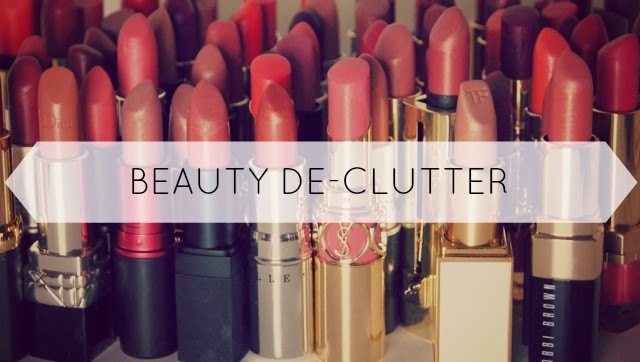 Do you have any tips on cutting down your beauty collections? Urgh, de-cluttering my beauty stash is something that I have been struggling with for the longest time. I just don't have the heart to do it. Too sentimental for my own good I'm afraid. Thanks so much for these tips. i definitely need to do this, good tips!